Anyone who knows me, knows that I love stripes. 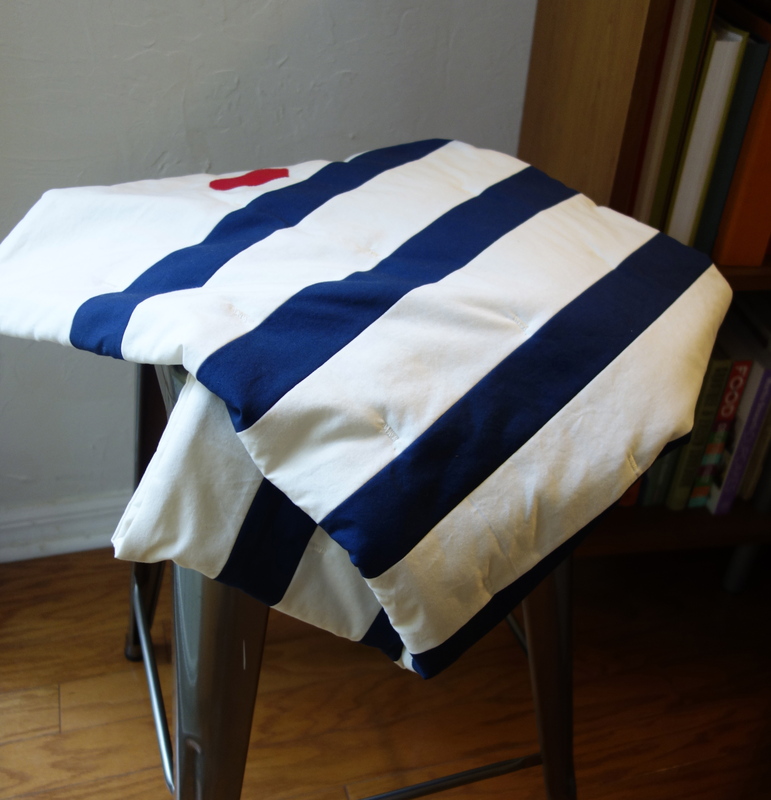 I bought my first striped bateau shirt from Isle of You (!) in Ithaca, NY, and I have had at least one in my wardrobe ever since. My husband and I just visited Charleston, SC, for the first time. It is a very jaunty town with nautical stripes at every turn. Just my sort of place. I came home inspired to use my favorite pattern in a little baby quilt. 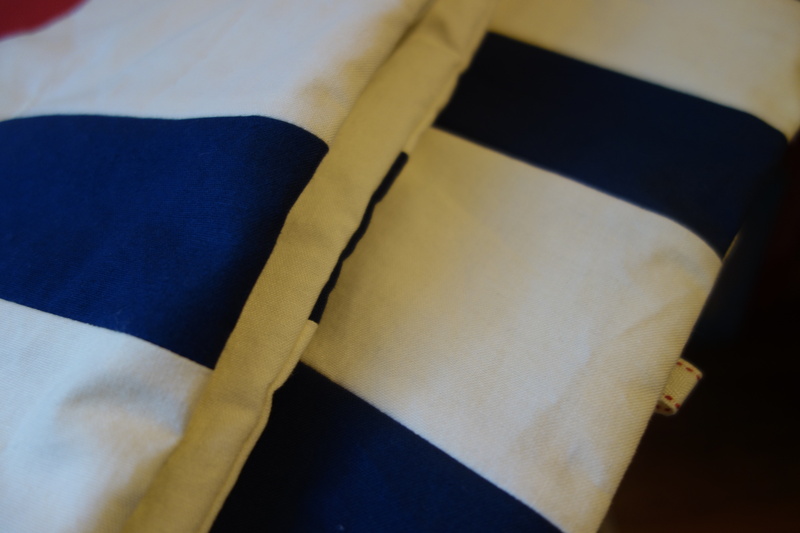 This cream and navy stripe is the classic Breton pattern, with a broad band of cream at the top. 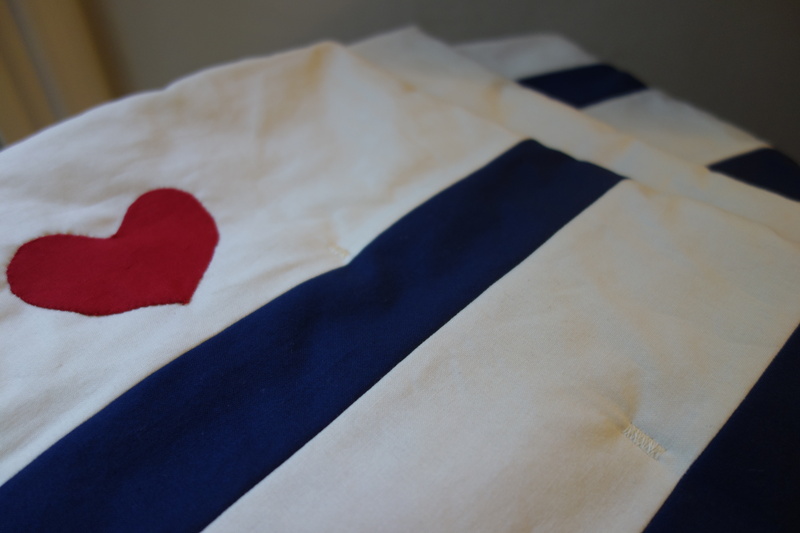 I hand appliqued the heart at the top–I like how the red pops and adds a little more fun. I was excited to use wool batting for the first time–wool is such a great material for a baby blanket. Wool keeps little ones cool in summer and warm in winter, and is incredibly cozy. Best of all, the batting is superwash wool and can be machine washed and dried. I thought it might be difficult to sew–especially since you stitch with the batting facing out–but it was really lovely to work with. The pattern is adapted from the Purl Bee Lap Duvet. (I used Kona quilting cotton rather than double gauze and lengthened the quilting stitches to make this quilt durable enough to withstand lots of washings.) I really like how the lack of binding and the minimal quilting makes this quilt so lofty, and the wool is lighter than even the lightest cotton batting. This quilt would work equally well as a play mat, stroller blanket, or crib blanket. I tried all kinds of patterned fabrics for the backing but ended up using the solid cream. I like the sweet simplicity of the finished quilt. You can find this quilt in my Etsy shop! This entry was posted in kids stuff, quilts and tagged baby quilt, Breton, Charleston, Etsy, Ithaca, nautical, nursery on June 25, 2013 by brigitdermott.